Take us to your candy! Deep into outer space lurk visitors who make their way to our pale blue dot once a year to steal all the candy they can get their hands on. They make sure to time it to October 31 to maximize their results by taking advantage of customs of the native creatures of this planet. Now your child can join the space invaders in this out-of-this-world costume! What parent hasn’t felt like their kids are invaders from another planet? Here’s the proof! Let your pride and joy inhabit outer space comfortably in this alien costume with a scary mask. This costume might be a little more Twilight Zone than Alien, but there are plenty of costumes out there: this one is for the kid who likes their outer space invaders a little more retro. And every alien knows a cloak’s a lot better than a metallic jumpsuit for relaxing around the saucer and blending in among the Earthlings. It’ll be another hundred years or so before the Earthlings start dressing like that. 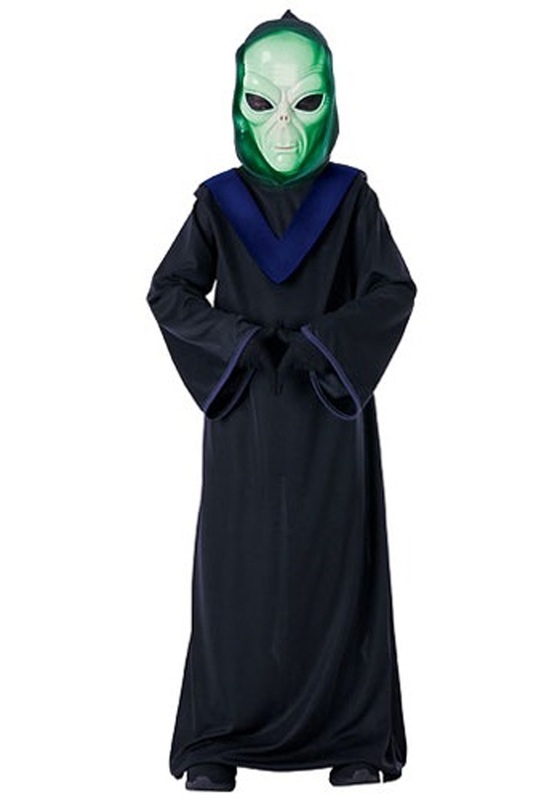 This Space Alien Kids Costume includes a black full-length pullover robe with a blue v-neck collar and blue trim on the sleeves (the hottest fashion on Alpha Centauri, we assure you). The hood fastens under the chin with Velco, and the plastic glow-in-the-dark mask has large eyes that are sure to trigger any abduction survivors. It has black fabric gloves to hide their human hands and fastens around the back of the head with an elastic security band so it won’t slip at the key moment and give your kid away as an Earthling after all. Just make sure they don’t get carted away to Area 51.